What is presented in the statistics section? Through the "Like" and "Dislike" buttons, the user can express his/her positive or negative opinion on the draft, as well as can be informed about the number of views and presented offers. Draft legal acts developed by the RA Governmental bodies are placed on the unified website for publication of legal acts. 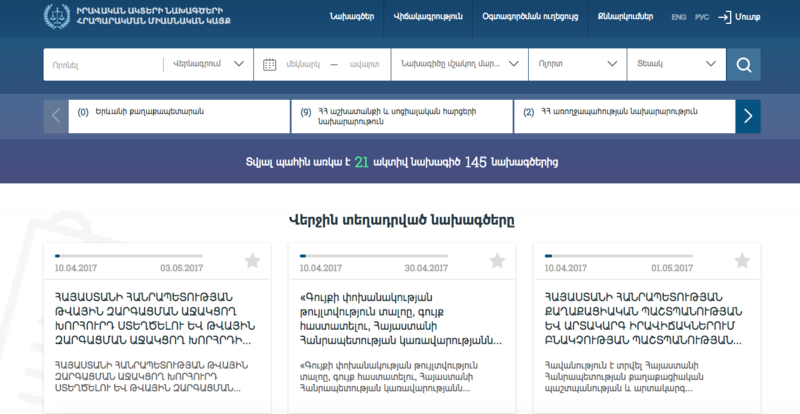 An online platform has been created with the introduction of the Unified Website, which provides the possibility of presenting legal acts’ drafts to the public, organizing online discussions, and as a consequence - the active participation of representatives of civil society in law-making process. The website permits to get acquainted with the legal acts’ drafts, look for them, follow their further progress, and become familiar with the presented suggestions. The registered users will be able to present suggestions, get acquainted with the conclusion paper of the suggestions of the legal acts’ drafts, the adopted suggestions or the justifications concerning the not adopted ones. How to get informed about public discussion? The section "Public Discussion" contains information on the date of the public discussion, the time and place of the meeting.